Switching to a nutritious diet is often the first line of defense against ailments ranging from IBS to the common cold. However, preparing a healthy and complete meal first thing in the morning is a difficult task for many seniors and their caregivers. Here are five nutritious and delicious breakfasts you and your aging loved one can prepare in just a few minutes. Instead of cooking a big meal when you wake up in the morning, you might want to do all of the work the night before. Overnight oats require nothing more than some milk and a cup of oatmeal. You can also add berries for extra vitamins or seeds for some protein. Overnight oats are naturally sweet, which means you won’t have to add processed sugar or other unhealthy sweeteners. The whole oats can also lower cholesterol levels and promote digestion. Seniors who want to remain healthy as they age can benefit in a variety of ways when they receive professional home care. Green Valley, AZ, Home Care Assistance is here to help your loved one accomplish daily tasks, prevent illness, and focus on living a healthier and more fulfilling life. Very few breakfast dishes are as easy to make and nutritious as egg muffins. These muffins take 20 or 30 minutes to bake, and they last for a week or longer in the refrigerator. Eggs are high in iron, vitamin D, calcium, and other nutrients that strengthen the bones. You can also add one or more servings of your loved one’s favorite vegetables to each muffin. Egg muffins will stay good for up to three months in the freezer, but colder temperatures can alter the texture. Breakfast burritos can be made with almost any ingredients in the kitchen. Scrambled eggs can easily be taken to the next level with some leftover meat and vegetables from the night before. Adding some shredded cheese and beans to your loved one’s breakfast burritos will provide energy throughout the day. Some seniors need help preparing nutritious meals. If your aging loved one needs occasional help with bathing, grooming, cooking, or other basic household tasks, or if you need time to attend to important personal matters, reach out to Home Care Assistance, a leading provider of live-in and respite care. Green Valley seniors can maintain their independence while living at home with the help of our reliable respite caregivers. 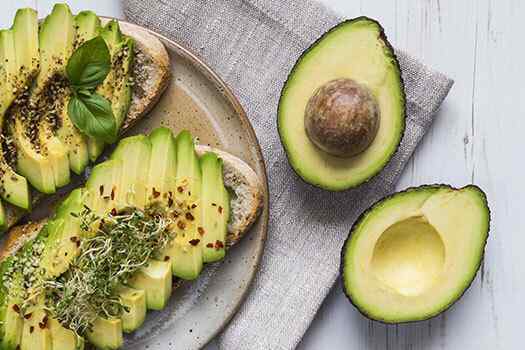 Avocados are the perfect fruit for seniors who are trying to maintain a healthy weight. Most of the calories come from healthy fats and micronutrients. When combined with a slice of whole wheat toast, your loved one consumes a variety of vitamins and minerals. If your loved one needs more protein, you can put a scrambled egg or bacon on top of the toast. Smoothies can be extremely healthy as long as you include the right ingredients. A yogurt smoothie with berries and hemp seeds contains the perfect blend of carbs, fats, and protein. One of the biggest benefits of smoothies is that their taste can easily be adjusted with healthy ingredients like cinnamon and honey. You can also use probiotic-rich yogurt if your loved one has intestinal or digestion issues. Eating nutritious foods can boost your loved one’s health, wellbeing, and overall quality of life. If your elderly loved one needs help maintaining a high quality of life while aging in place, reach out to Home Care Assistance, a trusted provider of Green Valley senior care. Our caregivers provide transportation to and from medical appointments and social events, nutritious meal preparation, assistance with daily exercise, and help with everyday tasks like bathing, grooming, and light housekeeping. To hire a professionally trained caregiver for your aging loved one, give us a call at 520-625-2050 today.